The tiered branches of the Japanese dogwood (Cornus kousa) look stunning when covered in white bracts and flowers. 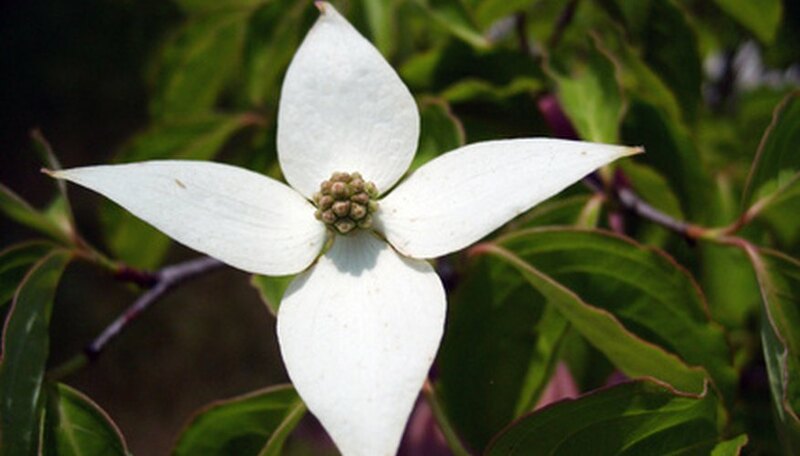 Also known as the kousa dogwood or Korean dogwood, this plant grows 20 to 30 feet tall and wide. Plant-lovers in USDA hardiness zones 5 through 8 delight in the numerous ornamental qualities of this dogwood in their gardens. The Japanese dogwood is native to extreme eastern Asia, including Korea, northeastern China and Japan. It is a small to medium-sized woodland tree, growing primarily in sandy or loamy soils rich in decaying organic matter. With four seasons of ornamental interest, Japanese dogwood bears a multi-colored mosaic on its bark. Colored tan, gray and brown, it looks like a jigsaw. Older plants hold branches in horizontal tiers, most visible when leaves and flowers appear. The display of thousands of tiny yellow-green flowers surrounded by white bracts highlights late spring and early summer atop the foliage. The bracts linger for weeks, often extending the "flowering" display to midsummer. In autumn, the bright coral-red fruits ripen, looking like tiny submarine mines and the foliage turns to shades of red, maroon or burgundy before dropping. Grow this dogwood in an moist, well-draining soil with acidic to slightly alkaline pH (5.0 to 7.8). For best flowering and full development of branches and overall form, plant in full sun, receiving at least eight hours of direct sunlight daily. It tolerates more shaded sites, but with reduced flowering. Unlike the flowering dogwood (Cornus florida), Japanese dogwood possesses a strong resistance to the fungal disease anthracnose. Moreover, the tendency of this species to grow in sunnier, more exposed settings diminishes development of powdery mildew and sooty mold on its foliage. The numerous ornamental features of the Japanese dogwod finds it primarily grown as a singular specimen in a spacious lawn or mixed garden border. Having low branches, using it as a street tree creates problems if planted too closely to the thoroughfare. Removing the lowermost branches when the tree is young trains the plant into a shape better suited for use around sidewalks, driveways and avenues. Also grow it if you wish to supply food and cover for songbirds.